I realized that I was over complicating matters and making things too complex when it came to creating digital portfolios with my 9th grade ELA students. I am passionate about technology integration in my class, but I am mindful of how/why we use the technology. 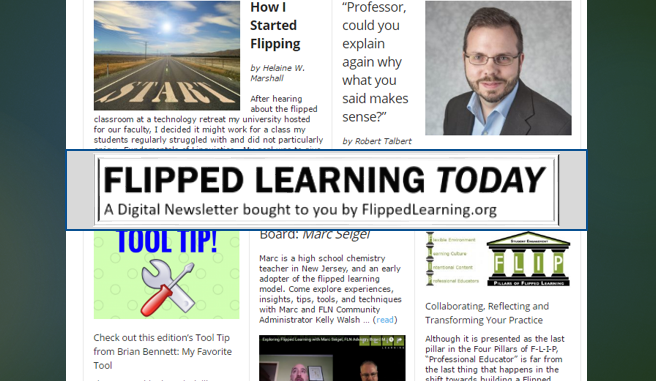 As I flip the learning in my class, it is easy to get inundated with the myriad of edtech tools and sites that are available. So, keeping things very simple, and sticking with what we know, I decided to capitalize on the power of Google Docs and hyperlinks to create a digital portfolios with my students. The portfolio is one Google Doc on which the student will list and link to each of the writing pieces, as well as write a brief reflection of what was learned about the process of writing. In Google Docs, create a template hyperdoc of the portfolio. 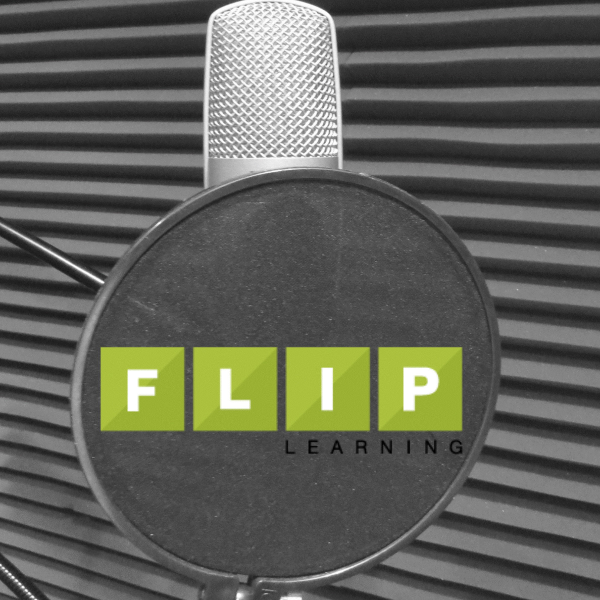 In Google Slides, create a slide deck that walks students through the set-up process. In Google Classroom create an assignment and attach the slide deck ("anyone can view") and template doc ("generate an editable copy for each student"). Allocate time in class for students to work on the portfolio. Score the portfolio each marking period. 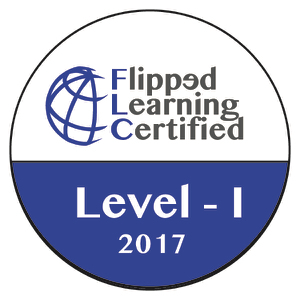 If you haven't picked up a copy of The Hyperdoc Handbook, you better do so NOW. Author Lisa Highfill and all share strategies for creating Google Docs with an enhanced visual design. The template I created for the portfolio is organized by inserting tables to create title areas and lists of assignments. Also, I changed the background color of the page and the fill color of each table section. By changing the visual design from the usual white Google Doc, I am influencing students' initial reaction to the doc: because the portfolio doc looks differently than the other docs they've seen, they will react to it differently. Students are allowed to personalize the doc and change the fonts and colors, but I want to make sure that they have a consistent theme to their visual design. Color palette generator such as Coolors and other activities that teach students about visual design facilitate the process. your own editable version of my template. 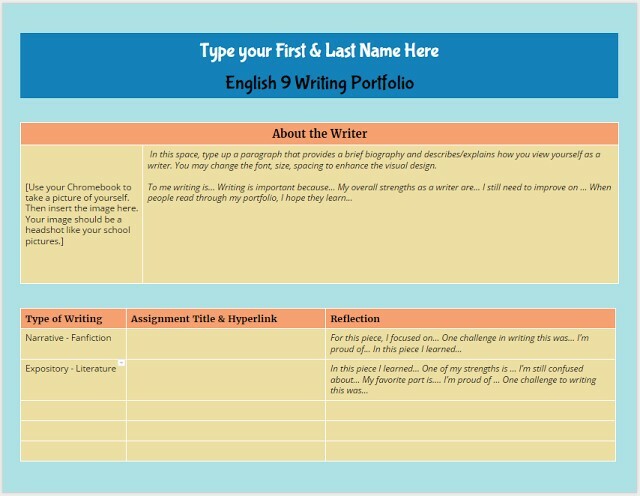 The sections of the portfolio doc include a heading area for the student's name, an about the Author section, and a list of the assignments that include a label for the type of writing, the assignment title and link to the student's writing piece, and an area for reflection on the specifics of the writing task. The most important area is the reflection. If I want students to act like authors, then I need them to think about the intention of their writing and reflection on the process of creation. 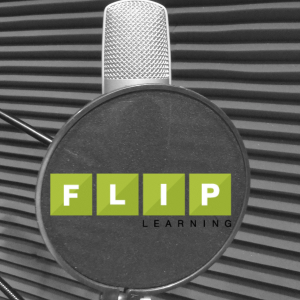 To lead students through the set up process in a flipped instructional manner, I created this slide deck that walks students through the process. 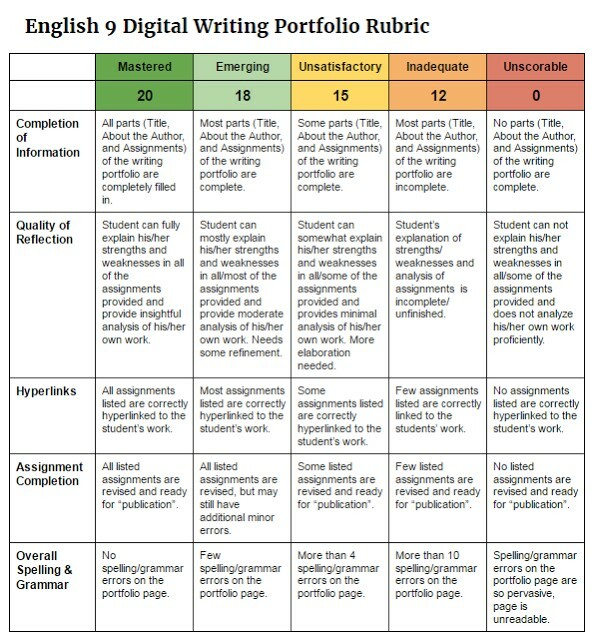 You'll notice that I also included the rubric for scoring the portfolio with in the slide deck. More on scoring later in this post. If you aren't using Google Classroom yet for your Google Docs workflow with students, you are missing out! Google Classroom makes managing student docs so much easier. For each assignment I create, I can attach resources and templates. Each attachment can be set to view only or editable by all, or I can have Google generate an individual copy for each student that has the file name and sharing permissions automatically created. No more untitled docs! 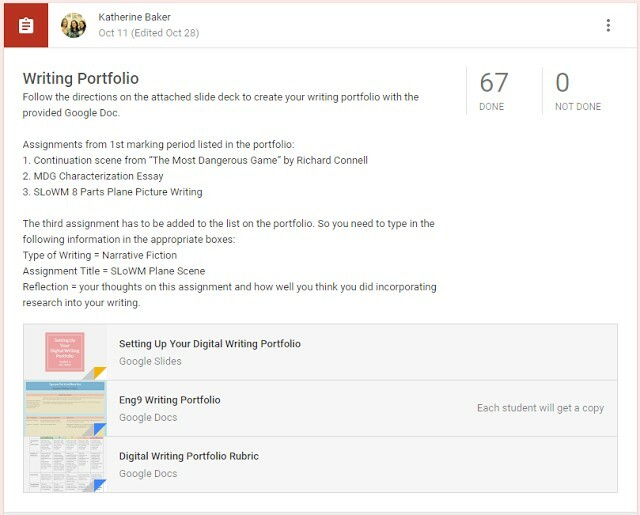 For the Digital Writing Portfolio Assignment in Google Classroom, I attached the slide deck (set to view only) and had Google generate an editable copy of the portfolio doc for each individual student. All docs created are housed in the folder for this assignment in my Classroom folder in my Google Drive. As we finished up individual writing pieces, I allocated class time so that students could add the latest assignment. The beauty of using hyperlinks for each assignment is that my students are not just limited in creating Google docs of their assignments: anything that they create that is housed on the web can be linked to their digital portfolio doc. At the end of each marking period, I give students time to finalize their digital portfolio. In Google Classroom, the students click DONE to submit their assignment, thus removing editing privileges on the doc. I score the portfolio with the rubric below using the Doctopus and Goobric add-on in Google Sheets. After all portfolio docs are scored, I return the files to the students. At the end of the next marking period, they revise the portfolio doc and hit DONE on the same assignment I first created-- no need to create a new assignment for each marking period! Philosophically, I am against putting grades on writing, but working within a system that mandates grades on assignments, I focus on providing feedback and ample opportunity to revise assignments until the student (and I) feel that the piece has met the objectives while also finding a way to get a numeric grade on the assignment. I do not give half scores or use other numbers for each column listed above. 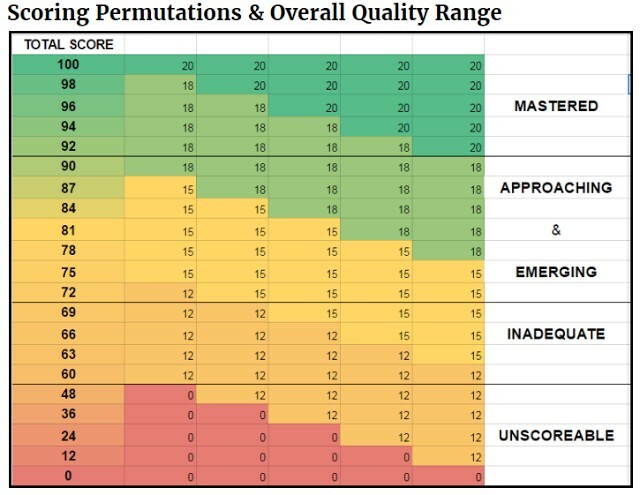 The numbers are the numbers, but you will see a greater range of scores when you look at the permutations of the possible rubric scores and what score shows mastery versus lacks proficiency. Rubric design and scoring will have to be saved for another post. But, if you look at the permutations above, because I made set each column score to a specific number that aligns on the 100 percent/point scale, I've allowed for more possible passing scores than failing scores. As Rick Wormeli will tell you, the 100 point scale (especially in my district with 100-70 as passing) puts way too much emphasis on failing grades. My scoring flips this dynamic and puts the emphasis on the upper range. BUT, the whole purpose of the digital writing portfolio is to de-emphasize grades and focus on publishing student work in a manner that is organized, reflective, and on-going, and using Google Docs as the housing system of students assignments is a method that is simple and sustainable. I don't have to worry about a special website or an app closing down in a few years, and students can easily replicate this process after high school graduation with their own personal Google Doc accounts to create portfolios for college and career. This is fabulous! 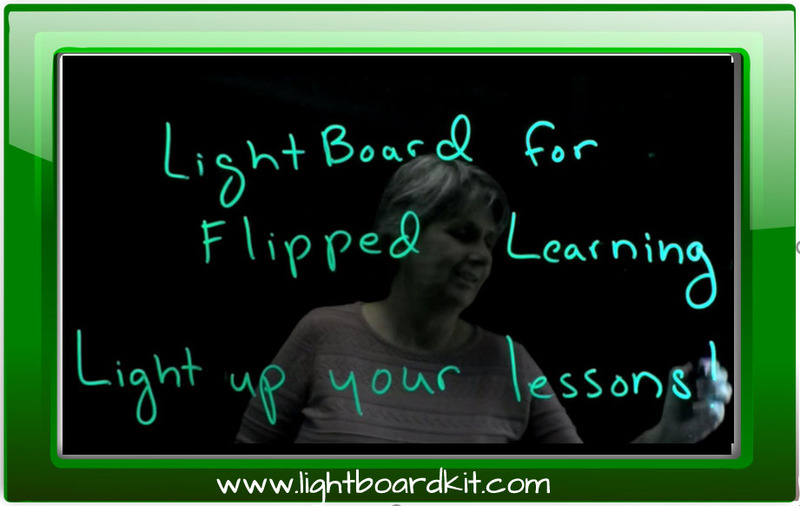 I love the idea of having everything on one hyperdoc. 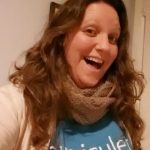 I have shared your ideas with our English department, and already, one of the teachers is exploring how she can make this work for her class instead of the digital portfolios she has done on a shared network drive. I am also going to use it for our Library Apprenticeship course to keep track of all of their assignments and reflections. I plan to explore using Goobric and Doctopus as well, as I really like the idea of de-emphasizing grades and focusing more on growth. Thanks so much for sharing these ideas! Thank you for sharing this with your English department. I am HONORED! Scoring with Goobric and Doctopus is a breeze! You are very welcome! Please let us know how it goes! Very nicely done! I especially love the visual appeal and the way you integrate the various tools with a focus on the workflow being as simple as possible. As a visual learner myself, visual appeal is very important to me. Simple workflow should lead to simple success! Wow! What an awesome idea! I am an elementary teacher and am eager to try to incorporate this into my classroom. My district uses Google Tools so I am excited to follow your expertise and do this with my students.